Turmeric has long been a popular spice in Indian cuisine. Curcumin is the active compound in turmeric that is known to have medicinal properties and health benefits. Are turmeric supplements worth it, or should we instead use natural turmeric root powder in our meals? Let’s have a closer look at some of the best turmeric and curcumin supplements currently available. Turmeric is a spice (some call it a herb) that is part of the ginger family. It comes in two different colors: white and yellow turmeric. There is in fact a black turmeric as well, but is not as well-known. When people refer to turmeric, they mostly mean the yellow version as this is the most common type of turmeric. White turmeric is also quite rare and is typically replaced by ginger. Native to India and often referred to as “Indian saffron”, yellow turmeric has a brown/yellow skin and orange/yellow flesh. It smells like a mix of ginger and orange with a peppery and bitter flavor. Turmeric is mostly known in powder form, created by boiling, drying, and grinding the root. Apart from the important role it has played in Indian cuisine, turmeric also known to have strong medicinal properties. The yellow color is caused by the high concentration of curcumin, the most beneficial compound in turmeric. Curcumin has been used as a traditional herbal medicine for many centuries, particularly in India and China. The positive effects of turmeric and curcumin on our health have made this spice more popular in western medicine as well. Turmeric and curcumin supplements are on the rise as more people learn about the potential health benefits. Curcumin has been linked to slowing down the effects of Alzheimer’s disease and reducing chronic pain and inflammation. There have also been results of studies suggesting that curcumin can be effective in treating depression symptoms as it helps to increase the serotonin and dopamine levels (known as “feel good” neurotransmitters) in the brain. Curcumin also helps with faster muscle recovery and decreases joint pain. Turmeric contains around 3-5% curcumin. So to make the most of this healthy compound, you would need to consume quite a lot of turmeric. This is why people often prefer to use curcumin supplements. Looking at turmeric supplements and comparing them can be a bit of a challenge and it’s hard to make sense out of it all. So let’s go through some of the common terminology and claims used with these supplements. This is the fun part of turmeric supplements. Curcuminoids are active compounds in turmeric that include curcumin but also demethoxycurcumin and bisdemethoxycurcumin (such complicated words!). It’s easy to think that curcuminoids and curcumin are the same, but they are definitely not. It is true though that curcumin is the primary component of curcuminoids, around 75%. Most turmeric supplements claim to have turmeric extract “standardized to 95% curcuminoids“. Unless otherwise stated, this means that around 75% of this 95% is actually curcumin, the compound we usually buy turmeric supplements for. More importantly, this turmeric extract component (with curcumin), typically only forms 10% of the supplement capsule. The other 90% is turmeric root (powder). Therefore, when the packaging says “with 95% curcuminoids”, this doesn’t actually mean that the capsules are 95% curcuminoids. Technically, The label isn’t incorrect, it’s just a bit confusing, or perhaps even misleading. A typical turmeric supplement contains around 90% turmeric root (curcuma longa), 10% tumeric root extract (standardized to 95% curcuminoids) and less than 1% black pepper extract (Bioperine). There is another issue with curcumin that many people aren’t aware of. Curcumin has a very low bio-availability, meaning it doesn’t get very well absorbed and leaves the body before it can actually do something with it. This essentially means that, no matter how beneficial the compound may be, the human body isn’t able to do much good with it. The solution for this is black pepper. Black pepper extract (also known as piperine) has been found to be very effective in absorbing curcumin. This extract is a manufactured product called Bioperine, which is in fact a registered trademark. Supplement manufacturers are therefore adding a tiny little bit of Bioperine to make the supplement much more useful. Bioperine is typically standardized to a minimum of 95% piperine. Bioperine is not only used in turmeric supplements. It has been successfully used for more than two decades to enhance the bio-availability of many other compounds and nutrients through increased absorption. Why Should You Consider Taking Turmeric Supplements? In a typical western diet, turmeric is not a very common spice. So most people in the western world are missing out on the health benefits of turmeric and its key compound curcumin. Sure, we could all start eating more Indian food or find other ways to add turmeric to our diets. Or as an alternative, we could consider taking turmeric and curcumin supplements. I’m normally quite hesitant when it comes to supplements as I believe that maintaining a healthy and balanced diet is always the best option. But I do believe turmeric supplements can add great value since a lot of people, including myself, don’t include enough of it in their everyday diet. So let’s have a look at some of the best turmeric and curcumin supplements available. The below products are selected based on brand trustworthiness, public reviews, pricing, ingredients and sales figures. While these products can’t do any harm, it’s recommended to always consult a medical professional, nutritionist or dietician for professional advice on your personal diet. This little NatureWise curcumin bottle contains 180 vegetarian capsules that each contain 1500mg of organic curcumin complex with turmeric root and curcumin extract standardized to 95% curcuminoids. The label does not state how much of the 1500mg is curcumin extract and how much is turmeric root. As with all supplements listed, NatureWise contains Bioperine black pepper extract to enhance the absorption of curcumin. Each capsule also contains 140mg organic ginger root for extra antioxidant properties and it also improves absorption. So each tablet is 1650mg consisting of 1500mg curcumin and turmeric, 140mg organic ginger and 10mg black pepper extract. It’s worth mentioning that NatureWise packages their products using recycled materials and renewable energy, and they obtain their ingredients from sustainable and certified organic sources whenever possible. They are also a generous donor and supporter of PINA, the Permaculture Institute of North America. This particular product is made in the USA and is third party tested. The turmeric supplement produced by Schwartz Bioresearch is a 100% natural, non-GMO product without any fillers, binders or preservatives. It is also free of gluten, soy, milk, egg, wheat and peanuts. The bottle contains 90 vegetarian capsules, each containing 1350mg turmeric root, 150mg turmeric extract and 10mg black pepper extract (Bioperine). Schwartz Bioresearch recommends taking three capsules per day, meaning one bottle would last one month. In my personal opinion, two capsules per day is more than enough, eventually bringing it down to only one capsule per day. The 150mg turmeric extract with 95% standardized curcuminoids is pretty generous compared to many other supplements. This Schwartz turmeric curcumin supplement is made in the USA and is third party tested. Nature Sciences packs 120 capsules in their organic turmeric curcumin supplement product, with each capsule containing 600mg of turmeric root, 50mg turmeric root extract (curcumin) and a tiny portion of black pepper extract. Just like NatureWise, this product also adds ginger extract (75mg) for extra antioxidant support. All ingredients used in Naturo Sciences supplements are non-GMO and gluten free. Manufactured in the USA, this turmeric supplement product is certified with the Good Manufacturing Practice (GMP) stamp. This turmeric supplement by Doctor Recommended provides 180 veggie capsules, each with a 750mg blend of turmeric root and turmeric extract with curcumin. Similar to the NatureWise product, the label does not clearly specify how much of this blend is turmeric root and how much is curcumin extract. Doctor Recommended is a US based nutrition company that produces their supplements in FDA registered, GMP certified facilities. Based in the US, NutriFlair is a supplement store with an extensive range of different products and a large customer base. This turmeric curcumin supplement contains 120 veggie capsules, each with 1200mg turmeric root, 100mg turmeric extract and 10mg black pepper extract. It’s a pretty standard composition in the market of curcumin supplements. NutriFlair claims to only use natural, non-GMO ingredients for their supplements, without any additives or preservatives. NutriFlair also offers a 100% satisfaction guarantee, with a full refund in case of any dissatisfaction. 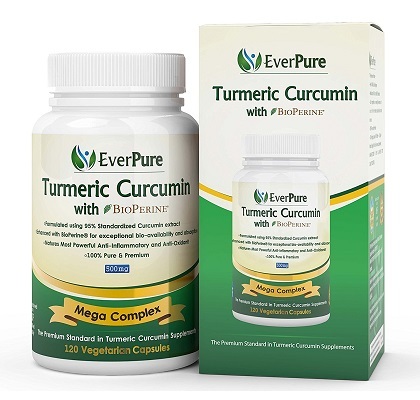 The composition of EverPure premium organic turmeric supplements is slightly different from other mainstream supplements. This product with 120 vegetarian capsules contains 250mg turmeric extract – which is very generous – and almost the same amount of turmeric root. EverPure recommends taking 1-3 capsules each day, either on an empty stomach or after a small meal. Proudly manufactured in the USA, EverPure uses all-natural ingredients for their supplements and contains no additives, preservatives or fillers. Turmeric curcumin supplements are definitely worth it as they add something extra to our (western) diet that typically lacks spices like turmeric. Herbs and spices have the most amazing health benefits and it’s a pity that western cuisine doesn’t make enough use of them. When choosing the best turmeric curcumin supplement, make sure you go with a reputable brand. Always read the label and have a good look at the ingredients to see how much of each active ingredient is used. It’s also good to know where the supplement has been manufactured and under what conditions. Very helpful article, I love turmeric. Anyone interested in herbs and spices should definitely check out the book Everyday Roots. It explains how to replace harmful chemical products in your life with organic ones. It has completely changed my life and how I feel everyday. Very informative article. Not only have I been using curcumin for many years but many family members have tried it and continued using it also. The likes of Ray Kurzweil at Google and Dr. Michael Greger suggest supplementation with curcumin also.